Most people are inspired to donate a kidney in order to save the life of a loved one. And some generous individuals aren’t a good match for their loved one, but donate anyway. Then, through a nationwide “kidney match” program, their kidney goes to a matching recipient, while someone else’s matching kidney goes to their loved one. Still other caring individuals donate the kidneys upon their death—giving life to another even as they give up their own. Donating a kidney this way can be as simple as checking the box on your driver’s license. However, it’s also a good idea to inform your loved ones of your intentions in conversations and in your will. But let’s say someone you love needs a kidney and you are willing to consider donating one of yours. The first thing to do is contact your physician to rule out any unforeseen health issues that would caution against donation. Then you’ll contact the patient’s hospital transplant team, which will run a series of laboratory tests to determine whether you are a good match for the kidney recipient. Some transplant teams also require the donor to undergo a psychiatric evaluation, just to make sure the donor is of sound mind and completely willing to make the donation. Once the pre-transplant tests have been run and confirm that you are a good match for the recipient, the next step is to schedule the surgery. The majority of transplantation surgeries are now laparoscopic, reducing hospital stays and shortening recovery times. Hospitalization generally will last for 2-3 days; longer for conventional surgery. After leaving the hospital, you’re likely to feel tenderness, itching and some pain at the incision site. Some donors will be advised not to return to work for several weeks and, in general, to avoid heavy lifting for about six weeks following surgery. You will likely be advised to avoid contact sports, to minimize the risk of injuring your remaining kidney. Other than that, you should be able to resume your normal physical routines. Donors’ medical expenses are typically covered by the recipient’s insurance. Of course, it is best to confirm this with the transplant team prior to scheduling your surgery. What if I donate and need a kidney later? Unless you have a pre-existing condition or other factor that predisposes you to kidney disease (which you should discuss with your doctor), you should be able to live your life without medical consequence from donating a kidney. No one can guarantee this, however; this is a potential risk of donation. It may be come comfort to know, however, that UNOS—the United Network for Organ Sharing—gives waiting list priority to individuals who have been organ donors. How will donating a kidney affect my life after donation? As long as you have been evaluated thoroughly and cleared for donation, you can expect to live a normal life with one kidney. Your remaining kidney will increase in size to compensate for the loss of the donated kidney. Living donation does not change life expectancy, and does not appear to increase the risk of kidney failure. In general, most people with a single normal kidney have no problems; however, you should always talk to your transplant team about the risks involved in donation. As noted previously, people with a single kidney are advised to protect it. For this reason, some doctors recommend to avoid contact sports like football, boxing, hockey, soccer, martial arts, or wrestling. 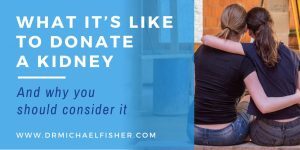 How will I feel emotionally after donating a kidney? An overwhelming majority (80%-97%) of living donors say that the experience of donating was positive and that they would do it again. These positive feelings, in large part are tied to the success of the transplant. It can be extremely disappointing to donate a kidney that is immediately rejected by the recipient. This is why the transplant team goes to such lengths to minimize the likelihood of this occurrence. 3. Talk with other living donors who can be particularly supportive if they have experienced the same feelings. Can I become pregnant after I’ve donated kidney? Most likely; however it is usually not recommended for at least six months after the donation surgery. Living donors should talk to their ob/gyn and transplant team before getting pregnant and should also make sure to get good pre-natal care. Generally, living kidney donors do well with pregnancy after their donation. However, some studies have shown small increases in some risks like gestational diabetes, pregnancy-induced hypertension, protein in the urine and preeclampsia. Living donors should inform their ob/gyn about their donation to allow monitoring for these potential complications.